You may assume that the TV or the speakers are the most important aspects of a home theater, but the first step is tailoring the room for enjoying home entertainment. Windows need motorized shades to reduce glare and you also need to consider the acoustics. If you want to turn up the volume really loud, but don’t want anyone in the rest of the house to hear it, you will need a soundproof door, or additional cushioning to absorb the sound. The less hard surfaces you have in the room, the better. If you have marble or wood flooring, the sound will bounce off the surfaces and create reverb. Carpet, acoustic panels and other soft materials – even the sofa – will help your home theater sound better. Our goal is to assess your home and make recommendations based on our years of experience. Once you have chosen the room and primed it, you can start considering the nuts and bolts of the home theater, like the projector, screen, TV or speakers. If you are outfitting a multi-purpose media room, a TV may work the best but you can use a projector too. Short-throw projectors are very popular right now and can sit on a coffee table or be hidden in a compartment in a nice piece of furniture. If the room allows for it, the projector can also be installed in the opposing wall, hidden from plain sight. High-contrast screens will look beautiful even in bright light. You can keep your shades open during the day and still watch football in beautiful 4K picture. For the speakers, we suggest Dolby Atmos surround sound. We can install in-wall and in-ceiling speakers around the room to create a three-dimensional listening experience. Our team usually puts two speakers in the back, one or two in the ceiling, two in the front and one bass. The number of speakers installed in a home theater is dependent on how large the room is as well as the type of walls. We can even combat structural limitations like brick walls and provide upward firing speakers. Whatever your home is like we can create a custom solution that meets your exact needs. 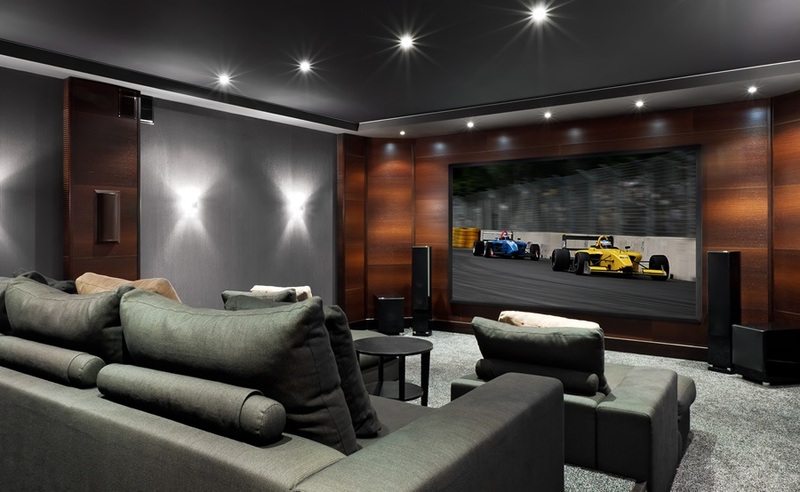 The type of room, screen and speakers are all important, but the magic of a home theater doesn’t come alive until you have the right control system. WSC Home Audio Video offers smart home automation systems that let you press one button and prime your room for an evening of amazing entertainment. The motorized shades will come down, the lights will dim, the TV or projector will turn on the movie, and the sound system will adjust to your particular settings all at the same time. The only thing left to do will be to get some snacks and relax with your favorite show. Would you like a new home theater system installed in your Virginia home? Contact us and let us know exactly what you are looking for.